A few questions with an experienced performance garment designer. After seven years designing activewear for Adidas, designer Hillary Day says, “I missed pretty.” The Portlander decided to take the world she knew of performance materials, pockets, functionality, and combine that with classic good taste for a new direction. 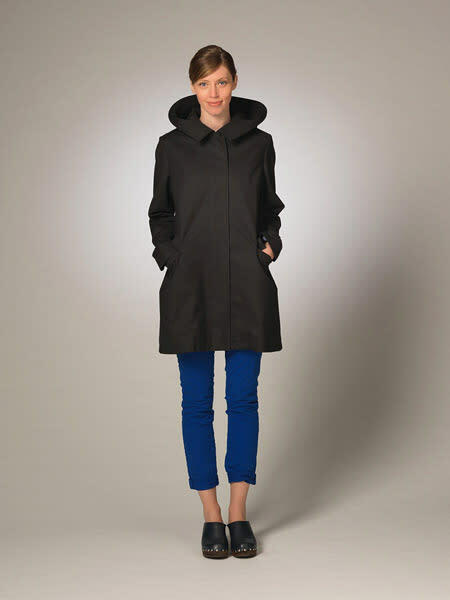 The result is Day’s line of wearable, functional raincoats that are, in fact, very pretty. After graduating from the Rhode Island School of Design she spent time at both Vera Wang and Ralph Lauren and that sophisticated touch shines onto her current work. The coats are all made to withstand our rainy days, while providing pockets and protection and, most importantly, looking city appropriate without a hint of back country. We stopped by Day’s new studio space in The Film Exchange Building to ask the seasoned pro a few questions. Eden Dawn: Why switch from designing athleticwear to raincoats? Hillary Day: Athletic wear is an interesting segment of design. A designer learns something totally different creating apparel for specific sports that integrates form and function that is unique to the industry. I was ready to try something on my own, and wanted to take what I knew from activewear and translate it into something that was more durable and lasting. And very wearable. And pretty. E.D: Do you think that background aids in creating the perfect coat? H.D: Absolutely. Athletic apparel is about movement, technology and comfort. Three really important ingredients in something you want to wear! Designing activewear makes a designer acutely aware of how a garment will feel while moving (sweating, downward-dogging etc.) through an activity or their day. Technology is also an incredible ingredient that not all designers get to work with, (wicking bridesmaid dresses could be next!) its incredible to see what fabric designers and companies are coming up with. Consumers love to have multiple-end-use fabrics and it’s fun to experiment with new materials and try to design something you want to put on your body. E.D: Who do you envision as your customer? H.D: my customer is a woman who needs great outerwear that is functional and chic. She’s between 25 and 95, and likes the idea that her coat has cool technology in it. She might be a great skier, but doesn’t want to look like it in the city. E.D: Your silhouettes feel so classic, where do you draw inspiration from? H.D: Everywhere! Runway collections, looking at fashion and art, books + magazines from different decades, watching people on the street… And looking at my favs, Vionnet, Balenciaga and Dior. So, so beautiful. Makes my heart leap every time. E.D: What do you think sets your jackets apart from the other’s out there? H.D: The coats are different because they are high-performance outerwear without looking like it. They’re great pieces that will work in any city and in all kinds of weather. The details are subtle but very feminine and fit like a dream. They’re made beautifully. Unexpected performance in a lady-like silhouette. And there’s no Velcro.